ROMABIO Classico Limewash acts like a paint in coverage and finish and will not create a bleed through with the brick, however, after you wash some off, the brick is exposed. How much you wash off is up to you and the look you want to achieve — the more washed off, the older and more dramatic the look. But, the dominant color for the home will be the color you pick for the Classico Limewash paint. It will not create a semi-transparent finish, but rather a flat finish. If this is the case, then how do you choose the right limewash color for your home? 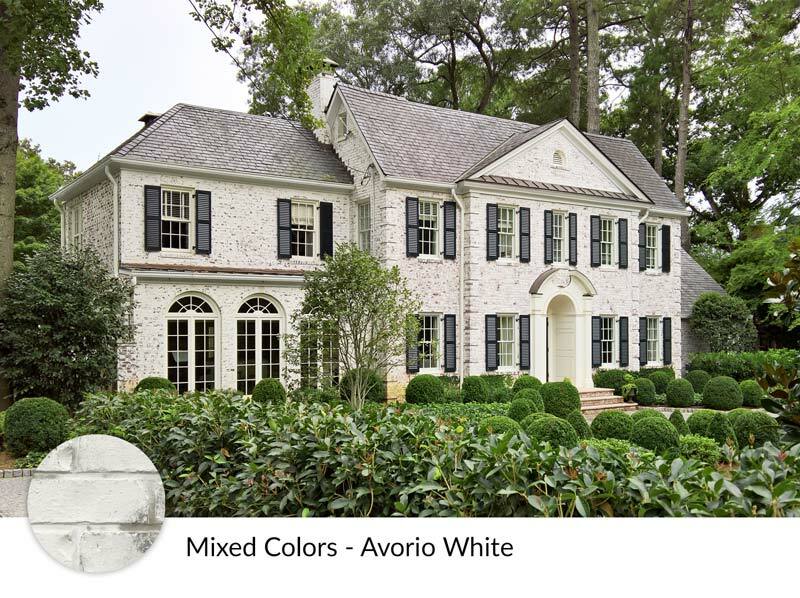 Cool Tones: If the roof is slate or gray shingles and the trim color is a cool white or cool light gray, then you will want to choose a neutral white, like Avorio White, or a cool white, like Bianco White. 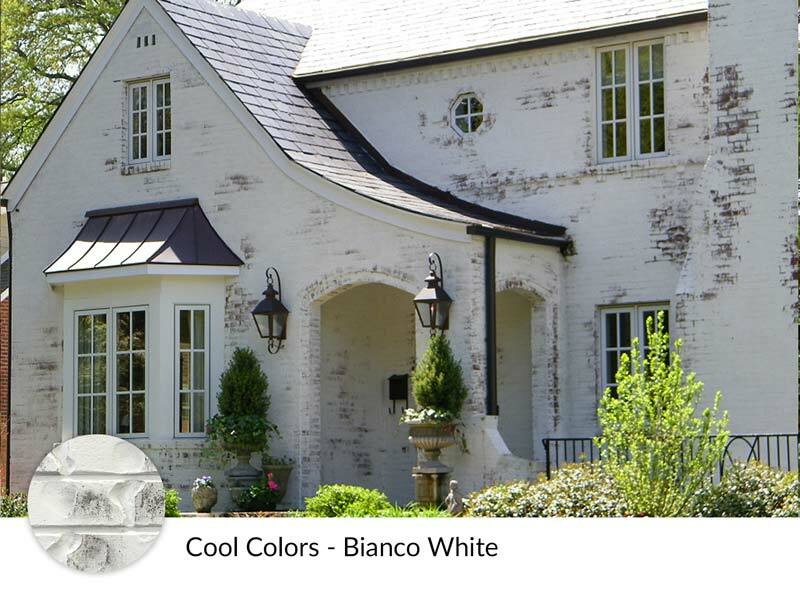 These colors will complement the cool tones of the home, and can be perfect companion colors, almost regardless of the brick color. 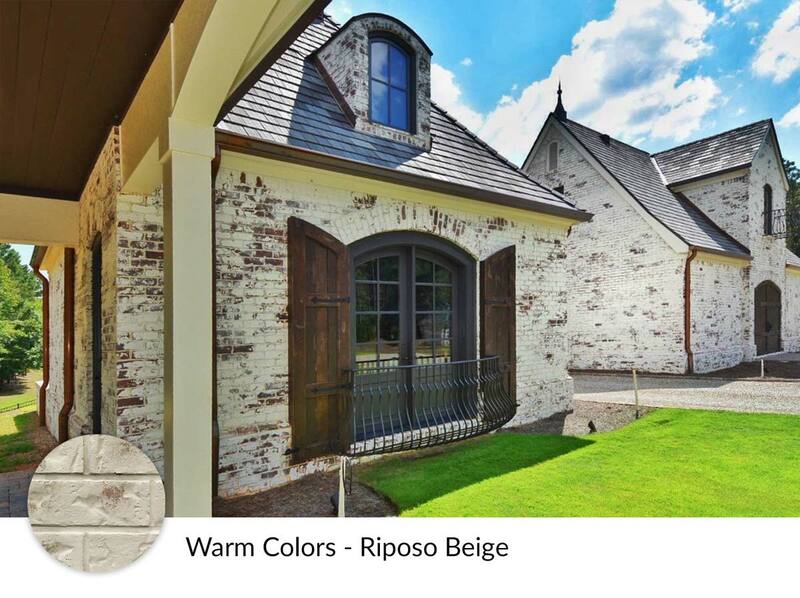 Warm Tones: If the primary trim is a very warm white and has an espresso or other warm color accent trim color, mixed with a warm color roof and darker bricks, then I would recommend these three warmer limewash colors: Tropea Beige, Riposo Beige, and Toscana Beige. Mixed Tones: In situations where the trim and roof colors compete a little bit with each other, and one is slightly warm and one is slightly cool, then I would recommend a slightly cool color such as Nube Gray or a slightly warm color such as Cristallo White. This way you can lead your home nicely in one way or the other. Or, you can choose the most neutral of them all, Avorio White and tie it all together. Color selection is important and the best way to make sure you get what you want is to order a 1 liter sample to test it first. The amazing thing about this product is it can be removed within 5 days after you apply it. Paint a small area on the brick surface, and see if it’s the color you want. You can have your paint applicator show you a sample of the wash off effect too, and decide if it’s the amount that you like. If it’s not perfect, then remove it instantly with a pressure washer or diluted muriatic mixture (details in TDS). We specially formulated the Classico Limewash paint so it can be manipulated and the advantage is you can test it first. It’s unlike any other brick paint in that way … enjoy the process! And, if none of these colors are working “just right” for you, send us your specific color and we will make it for you. We can color match other brand’s color palettes very easily. Previous Post: « Why our brick paint is the best. Can I use this on yellow brick or is it only for red brick? Which color lime wash would be best?